Grano arso literally means burnt wheat. Flour made with it is ‘farina di grano arso’ and has a history going back many centuries as part of the gastronomic tradition of ‘cucina povera’ in Northern Puglia. Farina di grano arso was traditionally made from the bits of wheat left in the field after the harvest. The stubble, called stoppie (STOHP•pyeh) or la ristoccia (rees•TOCH•chya) that was left in the fields was burned, then plowed back into the soil. 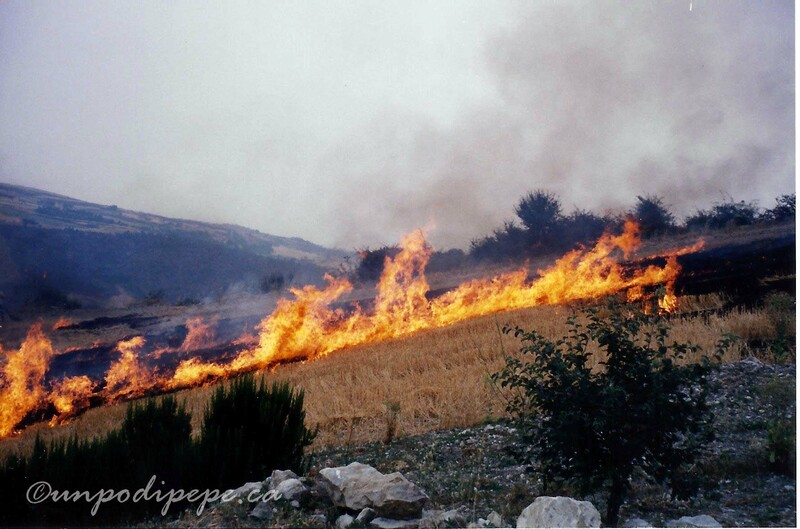 This was done as a quick and cheap way of clearing the fields. It was also thought to aerate and fertilize the soil and kill weeds and pests. In the short span of time between the burning and the plowing, poor farm workers (contadini) gathered burnt bits of wheat that were still usable and ground them by hand into farina di grano arso. It was mixed with white flour, making pasta and bread more affordable, or traded to buy other foods. ‘Pane nero’ (PAN•eh NEH•roh) or ‘pasta nera’ were considered the lowest quality of food and became a symbol of poverty-‘la miseria’ (mees•EH•ryah). ‘Pasta Nera’, an award-winning documentary that is not about grano arso, uses the title to accentuate the poverty in Southern Italia during and after the war. We know that food is more than just nutrition. The traditions and customs around food and its preparation are an integral part of a culture and teach us about the history of people and places at points in time. Cucina povera (coo•CHEE•nah poh•VEH•rah)and cibo dei poveri (CHEE•boh dei poh•VEH•ree) literally translate to poor cooking and food of the poor, but what is meant is ‘peasant cooking’. Farina di grano arso is important in a historical and cultural context as it really symbolizes the resilience and instinct to survive of our contadini ancestors. Grano arso was nowhere to be found for many years, but today many Pugliese chefs, including mio amico, il ‘cuoco contadino’ Peppe Zullo use farina di grano arso. 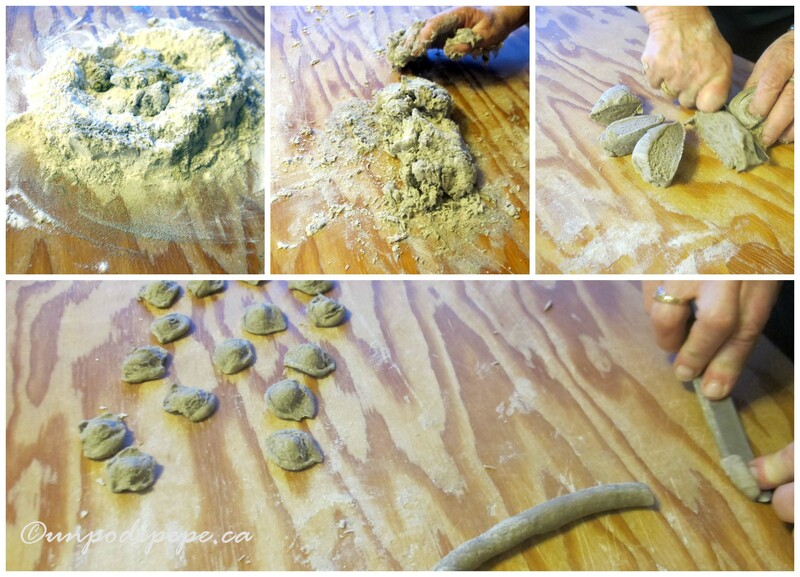 It is used to make fresh traditional Pugliese pasta- orecchiette, cavatelli, fusilli, and sometimes bread and focacce. Peppe is representing Puglia for the month of May in the Italian Pavilion at Expo2015 Milano. The theme is ‘Nutrire il Pianeta; Energia per la Vita’/ ‘Feeding the Planet; Energy for Life’. Appropriately, his feature dish for this event is cavatelli di grano arso e punti di asparagi verde. 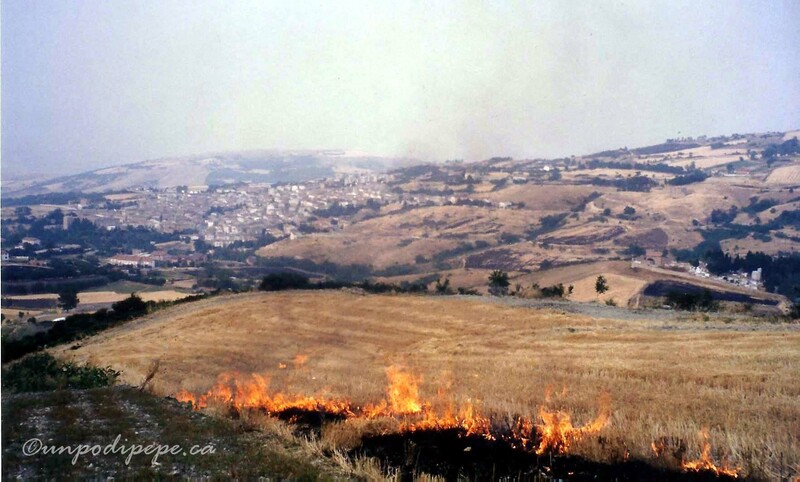 Bruciatura della ristoccia (broo∙chya•TOO•rah DEL•la rees•TOCH•chya), the burning of the stubble in the fields is now illegal due to carcinogenic concerns, destruction of soil nutrients, pollution and risk of forest fire. Today farina di grano arso is not completely burnt, it is commercially toasted. The flavor, colour, texture and smell of pasta or bread made with farina di grano arso are really intense and unique. 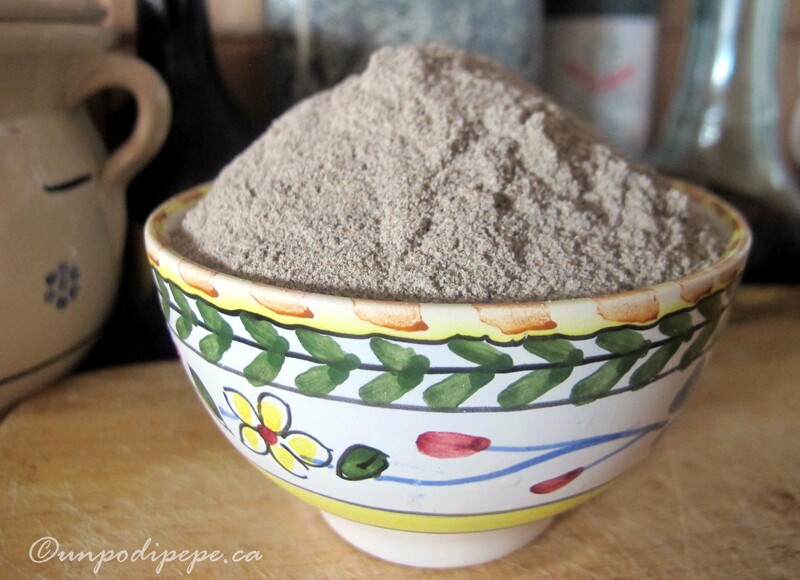 The flour is slightly grainy and the colour is grey like ashes- grigio cenere (gree•GEE•oh cheh•NEH•reh). Pasta can range from grey to brown in colour depending on the percentage of farina grano arso used. The smoked, nutty flavor reminds me a bit of toasted hazelnuts and the smell can be compared to lightly charred brick oven pizza crust. Most of the gluten is burnt off, so farina di grano arso can’t be used alone. It absorbs more water than other flours and will become a sticky mess that doesn’t hold together. Mixing 10% to maximum 25% with other flours that contain gluten produces the best results. Many people find pasta di grano arso easier to digest. Not everyone is embracing the return of grano arso to the kitchen. It disappeared because it is ‘un ricordo della miseria’-a reminder of poverty and there was vergogna (ver•GOH•nyah) or shame associated with having to eat pasta nera. This is something that most Italians who lived through the war don’t want to be reminded of. When I made the bread to photograph for this post, I brought it to my parents’ house for dinner. Papà made a sour face and said ‘Solo che vedo questo pane mi viene la paura!’ (Just looking at this bread puts fear in me!) He was kidding…sort of…I think? Well he did eat 2 pieces anyways! Farina di grano arso is available in Foggia and Andria. Pietro Zito in Andria sells 1 kg bags online for 6 €, as well as pasta di grano arso. Even if it was possible to send to North America though, the cost would be astronomic. Can you imagine Poste Italiane sending a bag of flour in the mail? You could try toasting durum wheat semola yourself on a baking tray in the oven, but it will probably result in a visit from i pompieri (pohm∙•pee•EH•ree) -the fire department- when the smoke detector goes off. I have a better idea- take a trip to Puglia and try pasta di grano arso in its natural environment! Buon Appetito! I enjoyed reading about the history of the Grano Arso. 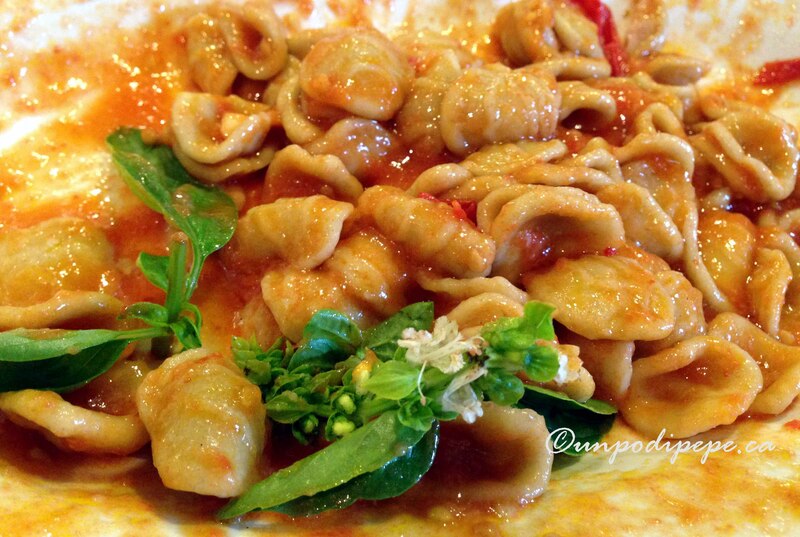 The Orecchiette di grano arso al sugo looks delicious! It must be fun to make…the anticipation of a delicious meal. Glad you enjoyed reading about grano arso Susan. 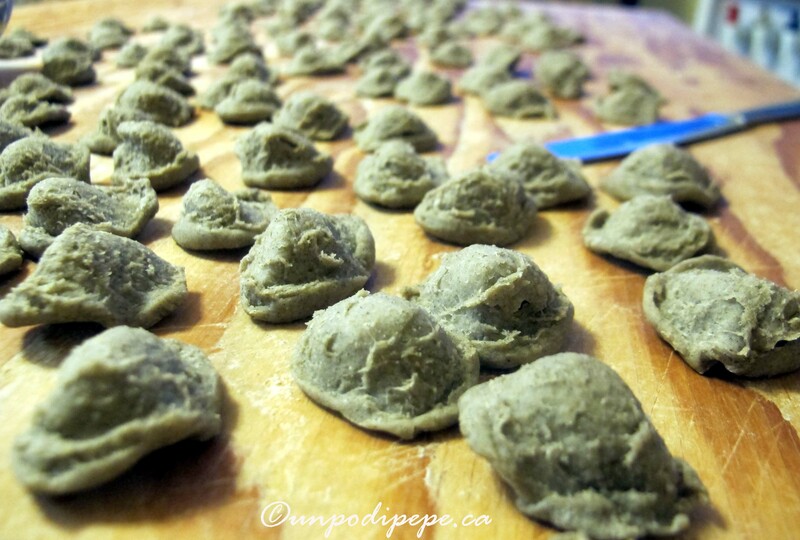 I’d say orecchiette are the most difficult pasta to make, so there is definitely a feeling of accomplishment making them! I have to make them more often-I have a few more cups of farina di grano arso, so I can enjoy a few more meals! What a fascinating post and a fascinating insight into cucina povera. I love learning about old traditions like this – maybe we should bring some more of them back as clearly our ancestors knew a thing or two about how to get the most out of the land without exploiting it like we do! It really does look like ashes. Interesting and actually I think it can be a taste adventure. Perhaps Cristina will , one day, indulge her amici with a taste of how “i poveri” ate thier orecchini! So it sounds like I need to invite my ‘poveri amici’ over for some quality control tasting? I think we can arrange that Patty! These traditions are so wonderful…..looks delicious too! That is really interesting Christina. I remember them burning the stubble of grain fields when I was a kid (in the 1970s) in England, but it was prohibited in the early 1990s. I never heard of people gleaning the burnt grains though. Forse e’ tipico soltanto della cucina povera Pugliese? Very interesting. I’ll be back in Puglia in May and I’ll be on the lookout for this Christina. We’ll be in Lucera and Ascoli Satriano, amongst other places. Perhaps a diversion to Orsara di Puglia? Thanks for writing about this topic and in so doing preserving a piece of Italian history – even if some would rather forget! Now I want to find some to see how pasta made with grano arso tastes!